South Korean President Moon Jae-in, first lady Kim Jung-sook, North Korean leader Kim Jong Un and his wife Ri Sol Ju pose for beside the Heaven Lake of Mount Paektu, North Korea, Sept. 20. Moon continued, "Here, at this place today, I propose we move forward toward the big picture of peace in which the past 70-year-long hostility can be eradicated and we can become one again." After the summit, Moon said he will pass along Kim's messages for the U.S. and the Trump administration. As Yonhap News notes, Moon expects to see Trump in New York next week, when he attends the U.N. General Assembly. To hurry the denuclearization process, Kim said he wants Secretary of State Mike Pompeo to visit Pyongyang and to set up another summit with Trump "as soon as possible," according to a summary by the Pyongyang Press Corps. It was the third meeting between the two Korean leaders, and the first to take place outside of the demilitarized zone. Before this year, two South Korean presidents had visited Pyongyang, hosted by the late Kim Jong Il in 2000 and 2007. But neither of those visits included the chance to address the people of the isolated nation. "The spectacle of the South Korean president speaking to wildly cheering crowds of North Korean fans was one of the memorable moments of the Pyongyang summit," NPR's Rob Schmitz reports from Seoul. "Moon said that he and North Korean leader Kim Jong Un had agreed to measures that would completely eliminate the fear of war and the risk of armed conflicts on the Korean Peninsula." On the final day of the summit, Moon and Kim took a symbolic step toward peace, traveling outside the capital to visit Mount Paektu – a famous and revered volcano that's also the highest point on the Korean Peninsula, situated along North Korea's border with China. 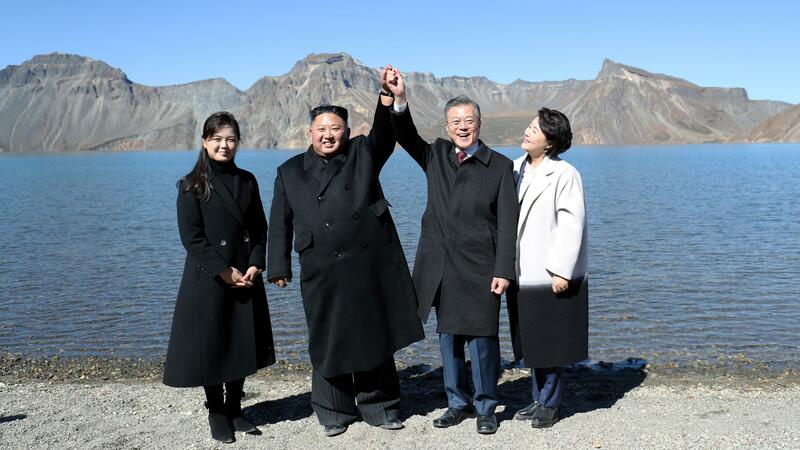 As Channel News Asia reports, "Mount Paektu is the mythical origin of the Korean people, featured in South Korea's national anthem and various North Korean propaganda." The two leaders and their wives posed at the site for photos, standing in front of Heaven Lake — a lake in the caldera of the sacred volcano. On Wednesday, Kim also said he plans to visit Seoul "in the near future" — a trip that would be historic in the relationship of these two countries that technically remain at war. The two leaders also released a joint declaration, promising to pursue peace, establish new communication channels and develop new economic ties — including railway and roads, and a special tourism zone. The Korean summit comes as the U.S. effort to get North Korea to shut down its nuclear weapons program has met with mixed results. U.S. officials are in touch with the North Korean regime, Pompeo said on Wednesday. "The relationship between Chairman Kim and President Trump is good," Pompeo said in an interview on Fox News that was transcribed by the State Department. "I talk to my counterparts there with some frequency. It doesn't get reported. I'm glad about that; I'm glad we're able to keep that quiet. And so we're making the progress that we need."